H.E. Mr. Yahya bin Said bin Abdullah Al-Jabri, Chairperson of the Board of Directors of the Special Economic Zone Authority at Duqm (SEZAD), received H.E. Son Byeong-Suk, Vice Minister of Land, Infrastructure and Transport (MOLIT), Republic of South Korea, in his office at Knowledge Oasis Muscat (Wednesday, 20 September 2017). The delegation acompanying H.E. Son Byeong-Suk included senior Korean officials and representatives of Korean companies in the petrochemical, IT, infrastructure, energy and railway sectors. During the meeting, both sides discussed cooperation in the development of SEZAD. 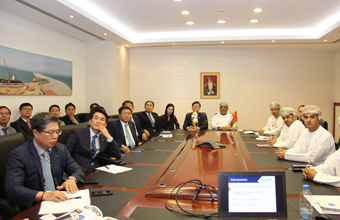 The Korean side was acquainted with the projects in the the Special Economic Zone in Duqm (SEZD) in terms of infrastructure and private sector investments. For his part, H.E. Son Byeong-Suk expressed his admiration for the development plans witnessed by the Sultanate and the progress achieved in various fields, referring to the economic cooperation between the two countries and the desire of the Korean side to develop it to broader horizons. During the meeting, the Korean side gave an overview of the Korean economy, the potential of Korean companies, particularly in the ICT and infrastructure sectors, and South Korea's efforts in the field of smart cities. The Korean side expressed hope that the Sultanate would benefit from the progress made by Korea in this field. SEZAD provided a presentation of SEZD and its strategic location on the Arabian Sea overlooking the Indian Ocean and its proximity to the international shipping lines, advantages and incentives offered by SEZAD to investors, and availability of large plots of land to invest in Industrial and commercial sectors, building hotels and resorts, real estate development and logistics services. At the end of the meeting, the two sides expressed their desire to strengthen the existing cooperation between them and participate in a number of economic projects for the benefit of the two friendly countries.